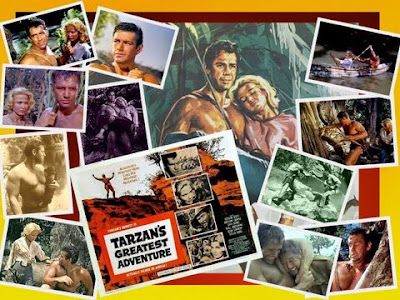 Warner Archive has lately released the Gordon Scott Tarzan shows. With no intent other than to confirm widescreen format, I put on Tarzan’s Greatest Adventure and wound up watching the whole thing yet again. It could stand restoration (what 50’s title shot on eastman negative wouldn’t? ), but overall, the presentation is adequate. Just seeing it wide for the first time was a kick. Greatest Adventure was absorbed along with most other Tarzans into a syndicated package that played television for years. Paramount hasn’t owned rights in ones they released since first-runs. 16mm collector prints were invariably pink or headed there. It's always been effort finding people who realize how good Greatest Adventure is. Boosters emphasize its adult appeal (as did the trade ad below). Well, early ones with Johnny Weissmuller were bold as well, but I’ve got to credit Sy Weintraub with nerve for pulling even fewer punches here. I've mentioned before the pre-credit sequence playing like James Bond teasers to come. I’m convinced it served as model for brass-knucked Brit actioners that quickened US 60’s pulses. Shots are fired at close range and victims bleed. Tarzan is within minutes shed of Cheetah as if to assure that it’s a serious game we’re playing. Gordon Scott gets most fan votes for best screen Tarzan. Who else brought such authority to strongman parts? Most came off either wooden or like a clown. Our impulse after all is to laugh at extreme Herculean types. Scott maybe realized that and low-keyed to a point where we wouldn't. So good as he is here, I wonder how GS registered in that Italo-Buffalo Bill pic he did later in the sixties (barely, if at all, released in the US). A little less Apollo baggage and he might have parlayed TGA (and almost as good follow-up Tarzan The Magnificent) into a wider range of parts. As for Greatest Adventure support, I've seldom come across UK players so vigorously flexing real muscles as opposed to mere thespic ones. Anthony Quayle sweats and oozes physicality in addition to customary mastery of dialogue. I’d like knowing how this actor looked back on his role as Slade. Surely he found it among ones most rewarding. Sara Shane recaps the Ava Gardner part in Mogambo to the extent of screwball-ish repartee with Tarzan as they jungle track Quayle’s murderous group, one of which is busting out of his stall Sean Connery, here to demonstrate how much energy he'd bring to bigger projects if only producers would notice (and a couple did, thus Dr. No a few years later). Tension within ranks of villainy keeps TGA on a high beam traversing 88 minutes as if half that length. End titles came before I knew it. My friend Mike Cline and I were out to a North Hollywood autograph fair about fifteen years ago and met Gordon Scott. In fact, we were appointed his chauffeurs by show manager Ray Courts. This was fine with Mike as he’d been a dedicated Gordon fan since TGA’s first-run in 1959. Here was opportunity to grill Tarzan as to all his adventures over seven or so miles driven very slowly between Beverly Garland’s Holiday Inn and a modest apartment Gordo occupied somewhere in Burbank. I found Scott to be rather subdued, not unlike his interpretation of the Jungle Man. He called both of us Pal, as though being driven around by two guys from North Carolina was nothing less than his due. He probably figured we flew out just for that (and maybe it did justify the trip, as I don’t recall that much else about it). Scott was serious in conversation, not given to levity, and knew his worth as an actor. And yes, he’d also come to recognize Tarzan’s Greatest Adventure as an outstanding vehicle for him. Gordon’s taste in movies ran to thoughtful fare. Breaker Morant was one he mentioned for liking a lot. GS had the air of a man who’d catalogued regrets long ago and was getting by as best he could on what was left. He wore the same workout suit for the two days we ferried him and had access to a high school track where he ran each morning, plus a pool at the apartment complex from which balconies we imagined him diving as he had off TGA's treehouse. Gordon's digs reminded me of motels lush when new in the early sixties, but languished since to a melancholic drab. Scott was clearly low on cash, as he’d put his Tarzan knife up for an auction that weekend at the Garland, then was visibly upset when it failed to make reserve. I liked him even if he’d forgot me five minutes after we parted. So who says celebs have to be hail-fellows-well-met? --- Well, for that matter, how many would define Gordon Scott as a celebrity by the mid-nineties? It was enough to be his "pal" for as long as it took driving him back and forth to where his signed name could bring ten dollars a throw and fans like us could assure him once again that he was King of All the Ape-Men. 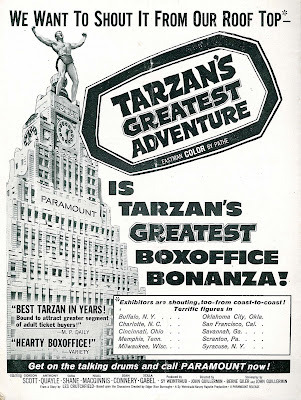 Thanks to Mike Cline for the Tarzan's Greatest Adventure montage, and go here for Greenbriar's post about Paramount's (mis)handling of TGA and Tarzan the Magnificent. What a cool story, well told. 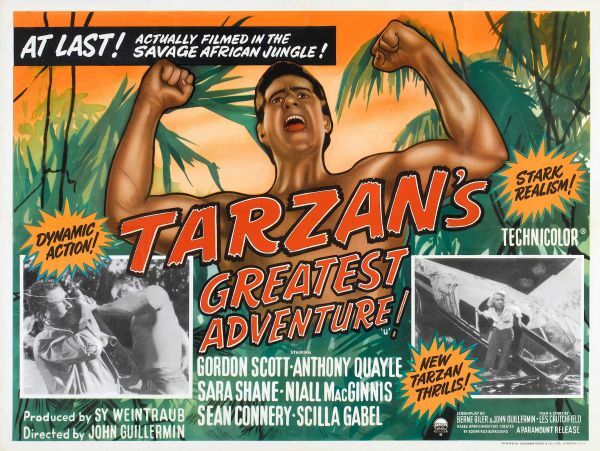 I first saw Greatest Adventure when AMC was running everything Tarzan back in the 90s, long after reading a rave write-up of it in Films in Review, and I found that the article was no false hype. It made me imagine an Anthony Mann Tarzan movie, especially during the final fight between Scott and Quayle. Magnificent was nearly as good and the end of Scott's run at that point was regrettable. I'm going to have to visit the Warner Archive soon and get those films. Great post John. It's fun to remember all the stars met at film festivals.....some were the nicest people you'd ever meet (Ben Johnson, Troy Donahue & Morgan Woodward are just a few that immediately come to mind) and some were beyond belief in self-importance (I won't name any but you might John!). ... and some were likeable combinations of friendliness AND self-importance, like the inimitable Adam West! Back when the Batman series was in its' prime, I can remember so well seeing Adam West tooling around on his motorcycle in Beverly Hills (right around where the William Morris Agency is -- maybe he wanted to visit his money). Was he "Self-Important" in those days? I think that might be a fair assessment. (God bless all actors -- "What you are I wouldn't eat", Felix Bressart tells Lionel Atwill in "To Be Or Not To Be") And mind you, John Iam not excluding myself by a long shot! I rec'd a nice email today from our mutual friend re publication of the Laurel and Hardy book. So glad I was able to make a modest contribution. Hope you had a great Thanks. Our mutual friend's outstanding new Laurel and Hardy book is also the subject of the next Greenbriar post, RJ. I saw "Tarzan's Greatest Adventure" in 1959 when it was brand-spankin' new. I adored it then (as a 7-year old kid) and I believe my instincts were pretty good as I still think it's the best "Tarzan" movie ever made. For those of you who either haven't seen it, or have only a nodding acquaintance with it (and next-year's follow-up "Tarzan The Magnificent")you REALLY owe it to yourselves to discover or re-discover this unjustly neglected gem of fantasy-adventure filmmaking. Absolutely first-class in ALL depts. "Tarzan's Greatest Adventure" really delivers the goods. Thanks for so many great articles on the movies I grew up with. I saw Greatest Adventure when it first came out. I guess I was 6 or 7. It scared the heck out of me. It was great. I don't think I knew who Tarzan was at the time although I had seen the Jungle Jim TV show so knew the jungle was a dangerous place. It played with another movie that I must have intended to see but can't recall what it was. I know it wasn't Edge of Eternity, another half of a double feature around the same time that also scared the hell out of me. I have a question for you. You spent a couple of days ferrying Gordon Scott around Hollywood. How did his nose look? The reason I ask is that there is a story going around on IMDB where some Italian character actor claims to have busted Gordon Scott's nose in a fight, ruining his looks and rendering him unable to get another acting job. I've seen later picture's of him and he still looks fine but how did he look in person? I'd hate to think the story was true but do wonder why his career dried up. Mike, I didn't notice anything unusual about Gordon's nose, but maybe I just wasn't observant enough. As to his being the best Tarzan, I say yes, he was, at least in my opinion. I first came across the high praise for Greatest Adventure in a journal while preparing a paper on Tarzan for a screen studies class. When finally seeing it years later on TV, I was blown away by how brilliant it was and the stark contrast between GA and the previous Scott installment. Scott really rose to the occasion. Met GS in 95, also, at a Western Film Festival in Knoxville, TN (in fact, I put a pic of he and I is on his Wikipedia article). Your article clicked two of my memories of the event. He wore the same white linen windbreaker, maroon shirt and cords three days in a row, and called every male fan "Pal." A nice guy, but not exactly talkative. Hi David --- Yes, the very same outfit he wore in California, and over the entire weekend. And both Mike and I were "Pal" the whole time.